Wintry conditions are set to return across the region this week. The north of Scotland is bracing itself for a spell of wintry weather with forecasters warning of thundersnow and travel disruption. 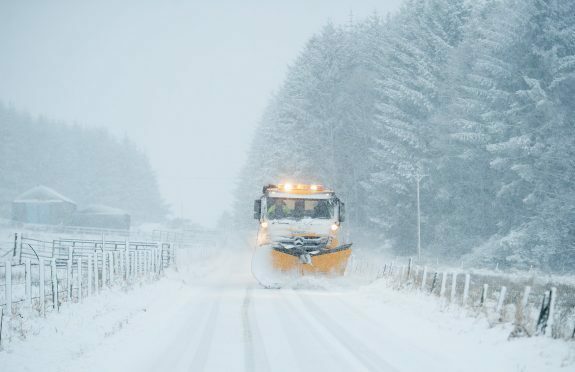 Temperatures are expected to plummet with blizzards and icy winds prompting warnings to be issued across the country and remaining in place until Thursday afternoon. The Met Office said the whole of the north of Scotland would struggle to stay above freezing and that there could be hail and lightning. Aberdeen-based forecaster Nicola Maxey said western sides of the country would be worst affected but showery patches could see snow falling across the region with up to 20 cms expected on higher ground. She said: “Snow showers are expected during Wednesday evening before a spell of more persistent and possibly heavy snow develops in places during Wednesday night. “Hail and lightning storms will also be possible across on the region from Monday evening and strong winds are forecasted from Wednesday which will further create blizzard conditions. Ms Maxey said no name had been assigned to the winter storm. She added: “It hasn’t quite reached the criteria for naming yet as there would need to be an amber warning, but we are keeping an eye on it. “On Wednesday night gusts of 60 to 70 mph can be expected and a deepening area of low pressure is expected to track east across the UK into Thursday. The next storm name to be chosen will be Fionn, which will then be followed by Georgina. Motorists are being warned to expect travel delays with the risk of some vehicles and passengers becoming stranded due to the weather in rural areas. The Chartered Institute of Plumbing and Heating Engineering also issued a statement urging people to take precautions against burst water pipes and make sure they know the location of stop-valves in their homes in case of an emergency.